Iman has left for Cagayan de Oro, Mindanao, the Philippines today. He will be back at midnight next Saturday. *sad* But it’s okay, I have a list of things-to-do while he’s away. We’ll definitely gna miss you, Daddy! Okay, back to the title. Since my early pregnancy, I have been using Johnson & Johnson’s Baby Oil (aloe vera with Vit E) at least once a day to prevent the stretch marks. When my tummy itches, I usually apply baby oil to relieve the itchiness and it works like magic! However, lately I find that I’m having dry skin and the itchiness become worse! Huhu.. Iman told me to get a proper anti stretch marks lotion and I saw Palmer’s at Guardian. But oh my.. it’s so pricey! So when we were looking for baby binder at Hua Ho Manggis, we found Pureen anti stretch marks lotion with reasonable price and bought it. 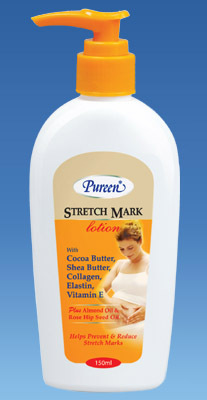 Pureen Stretch Mark Lotion with TRIPLE ACTION FORMULA, contains Cocoa Butter, Shea Butter, Almond oil, Rose Hip Seed Oil, Collagen, Elastin and Vitamin E to relieve itchiness due to skin dryness, strengthen skin and enhance its elasticity. Cocoa Butter, Shea Butter, Almond Oil and Rose Hip Seed Oil to moisturize skin and relieve itchiness due to dryness of the skin. Collagen and Elastin to strengthen skin and enhance its elasticity. Vitamin E to give antioxidant protection. You can check [here] for further information. I have just started using this lotion for couple of days. So far after applying twice a day, I don’t see the dry skin and it does not itch anymore. Alhamdulillah.. Yay!!! Low income with bad credit and apply car loan?